I think my sarcasm radar is broken. Our dentist again referred Miriam to the orthodontist. While she has no canine teeth on the top (at all) but plenty of space for them, her canine teeth on the bottom are coming in but have no where to go (at all). "I would get her in quickly," the dentist said. "But just know that she's probably going to need braces twice." I'm sure I looked with him with a bit of a panicked expression. "It'll be fine," he said. "Just cancel your next Hawaii vacation and fix her mouth. It will be worth it, I promise." And I stood there gasping for air a bit, completely unsure of what to say. Was he serious? We're a year out of graduate school. A fancy (or otherwise) Hawaiian vacation isn't even remotely on our radar. Should I plan one that we can cancel? Would that magically help us drum up enough money to pay for braces for her twice? I'm sure he was kidding about the Hawaii jab. Right? Unbeknownst to us, the department chair at the Romney Institute has continued to push for the creation (or rather the continuation) of a visiting assistant professorship for Andrew or the coming school year. The first inkling he got was when he was asking about how and when the termination of our benefits will happen. We know our benefits end before September and I'm, uh, taking the kids to the dentist tomorrow because there's nothing quite like the midnight hour. Anyway, he was told to call his department chair from Boston (he's at APSA right now, on his last "supported" conference, which he had to get special permission to attend because the conference breaches August and runs into September so the travel department was originally like, "You'll have to pay for your return flight..." but in the end they allowed him to use the very last of his research funds on a roundtrip ticket to Boston because it's kind of weird to pay for half a round trip ticket (and since it was purchased before the end of August it was kind of a grey area anyway))* before he did anything like purchase an insurance plan for our family from the ACA marketplace. Instead she called him this evening to tell him to forego looking at new health insurance plans at all because *drum roll* he'd simply be continuing on as a visiting assistant professor. We are shocked, relieved, and so, so happy. Our first Monday of the school year went fairly smoothly. Miriam purposely walked past the lost and found table on Friday afternoon and spotted Benjamin's lunchbox. They went to retrieve it together after school so when I showed up at the school to look for it I was instead greeted by a couple of triumphant children. Benjamin remembered to bring his lunchbox home today. He was also the "table leader" today, he informed me. "Ooh! What's the table leader?" I probed. "Well, it's kind of like a war leader," he explained, "Just for a smaller group." "Yeah!" he said. "Like General Washington but for my table." Sure, uh-huh, yup. That is exactly what your teacher was going for with that one, I'm sure. To be fair, this very solemn explanation he gave me means that he likely took his role very seriously. 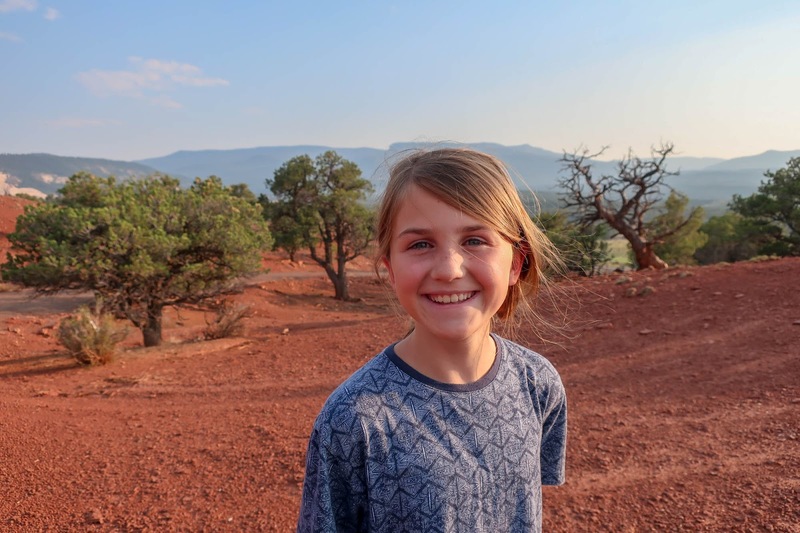 After visiting the alpaca ranch on Friday (August 10) we gave the children a tour of the "small stuff" around Capitol Reef National Park. None of us really felt like doing much hiking at that point in our trip anyway. We've given the children several lectures about how Alexander learns things by watching us so we need to be setting a good example. Specifically, I've been nagging the squirmiest of my children about their behaviour during prayers because, in my opinion, Alexander should know how to get ready prayer at his age (the ripe old age of ten months old, you know) but so far he hasn't even tried because, well, he's probably a little confused about what we do during the prayer. Do we fold our arms, bow our heads, and close our eyes while prayers are said? Or do we crawl around in circles, pick up toys and/or books to play with and/or read, and fidget, fidget, fidget? 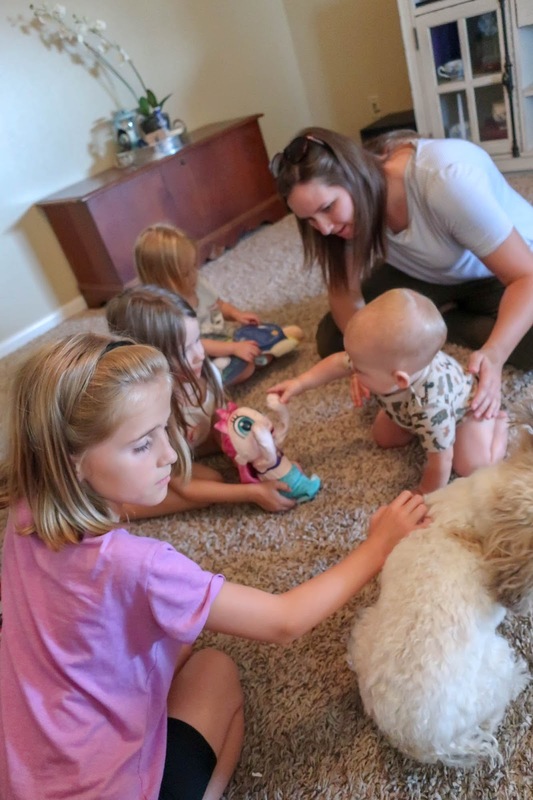 Sometimes it's rather difficult to tell at our house, because even during our mealtime prayers, which typically last about thirty seconds, prayer time is chaos. Seriously, thirty seconds and there'll be silverware dancing in the air, plates flipping off the table, fingerfuls of food being sampled, children falling off their seats. All they'd need to do is start singing and it would be a scene to rival the kitchen scene in Disney's Beauty and the Beast. Our constant reminders about setting a good example during prayer time finally seem to have taken hold, however, and the wriggliest of our bunch have begun making an effort to maintain a reverent mien during prayer time. 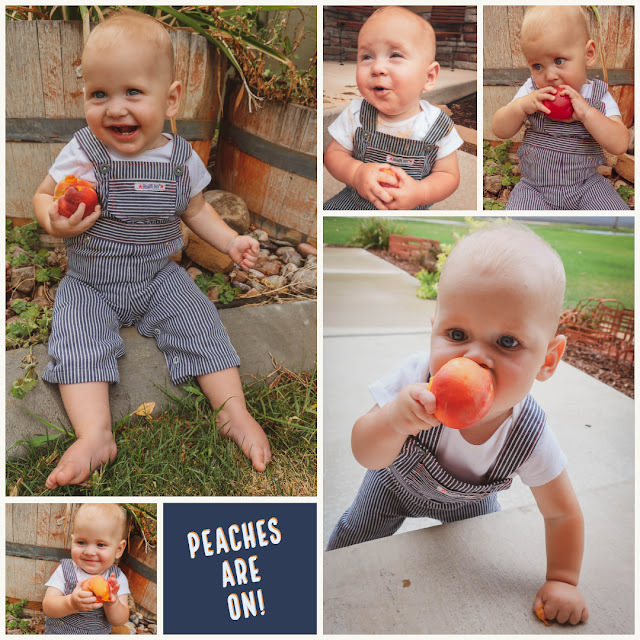 And, this morning, finally, my sweet little baby looked around at his siblings all kneeling down with their arms folded and their heads bowed and did his best to mimic them, clasping his pudgy little arms against his chest. Of course, Zoë was still in bed and Benjamin, who had been in the middle of breakfast when he was called for family prayer, sat at the bottom of the stairs rather than joining the rest of us upstairs, so Ander only had Rachel, Miriam, and Daddy to look at for an example (he was sitting on my lap so I'm exempt). At any rate, it was incredibly adorable and we're definitely calling it a win! Miriam, Alexander, and I went on a last-minute getaway with my mom and sister the weekend before school started. Austin's family was hosting an open house for him and Rosie and we decided we should go to represent the family. It's a good thing we did because I think Rosie was feeling a little outnumbered by Barkers and needed some familiar faces around her. Not that there's anything wrong with Austin's side of the family (in fact, his family is pretty amazing), just that going from single to married is a difficult transition. It takes time for someone else's family to grow on you. Anyway, we left on Friday afternoon and drove straight to St. George where we made a quick stop to visit my friend Shallee. Her kids started school last week and she wrote on Facebook about how her cute little Amaya came home from school so excited to have made a new friend. They were both wearing the very same pair of shoes and bonded instantly. I commented that that was fairly funny because years ago there was a girl in my US history class who was wearing the exact same shoes as me and we also bonded instantly—and it was Amaya's mom, my friend Shallee! Somehow the story is cuter when you're in grade one than when you're in grade ten/eleven, but don't knock the power of a cute pair of runners! The first day of school is here at last (and all too soon). The kids all got up and ready to go like professional students this morning. They were all quite excited (and a little bit nervous). 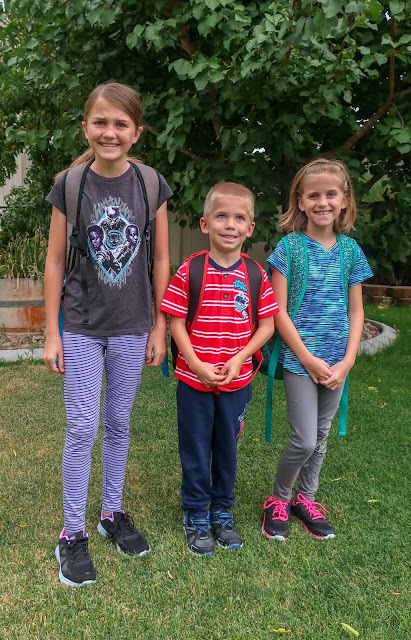 We took pictures before they left for school and the girls were a little thrown off when Benjamin squeezed his way between them, rather than standing to the other side of Miriam. Those two have been standing next to each other for first-day-of-school pictures for several years...and now Benjamin has finally joined them. 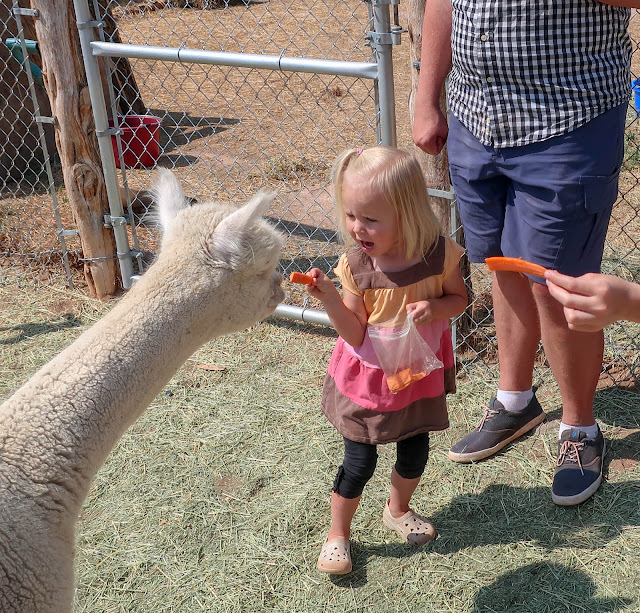 On Friday morning (the 10th) we took the children to visit Circle Cliff Ranch, an alpaca ranch just outside of Bicknell. It's run by Diena, a retired elementary school principal, who (along with her husband) sold her home three years ago to live her dream of raising alpacas, spinning yarn from their fleece, and selling her handiwork. Though retired, Diena is still passionate about education and opens her ranch up to visitors. Zoë, our resident llama lover, was particularly excited about our alpaca day. Alpacas aren't llamas, which we knew, but they are both closely related members of the camelid family and they look like alpacas so Zoë was thrilled (though intimidated) by all the alpacas. Ever since learning about the Plan of Salvation, Benjamin has been obsessed with making it to "actual heaven" (or the Celestial Kingdom) and avoiding being cast into "pit darkness" (or Outer Darkness). Tonight at dinner Andrew asked Benjamin to give the blessing on the food and Zoë, who is a bit of a prayer-hog, started pouting. "I never get to say the prayer!" she shouted. "You always say the prayer," Benjamin said. "You just want to keep all the blessings for yourself, don't you?" I asked Zoë, jokingly. "Really?!" Benjamin gasped. "Do you want to keep us all out of actual heaven!?" "Yes," she answered matter-of-factly. "I do." "Alright, alright," Andrew said in his best moderator's voice. "How about Benjamin says the prayer now and Zoë can say family prayer tonight?" So Benjamin began our dinner prayer. 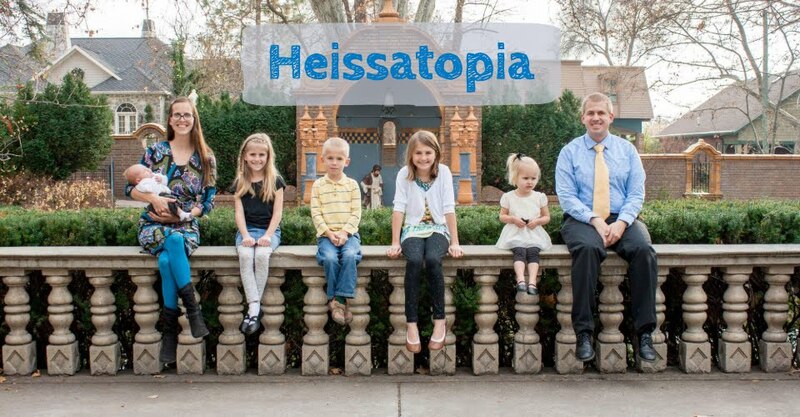 "Dear Heavenly Father," he said. "We are thankful for the food and please bless it." Then he added vindictively, "And please help us to keep Zoë from taking all the prayers so that the rest of us can make it into actual heaven, too." Stifled laughter echoed around the table, but we all managed to remain mostly reverent for the duration of the prayer. That silly, silly boy! Sulphur Creek is more or less an off-the-beaten path trail. It's never been maintained by the National Parks Service, though it's clearly inside Capitol Reef, and in the past there hasn't even been a map or anything to guide hikers. However, it has been gaining popularity over the past few years and now they have dedicated pull-outs for parking cars at either end of the trail (and although its still an unmaintained trail (on account of...it's a river) you can now get a map from the visitor center). We didn't know any of that, however, because Andrew and I hadn't been to Capitol Reef since 2012 (just a few weeks before Benjamin was born) and Karen hadn't been to Capitol Reef since 2013 (when Dorothy passed away on Brimhall Double Bridge Trail (though Reid went just a few weeks ago with a scout troop)), so we just started doing what we'd normally done and had Karen drop us off at the Castle Rock trail head. But there's a new pull-out/parking area about a third of a mile before this now (just so you know). While I nursed the baby, Grandpa took the other kids across the road to the dry creek bed (come to think of it, that's probably why they have the new pull-out area—so that you don't have to drag all your kids across the road to get to the proper trailhead). 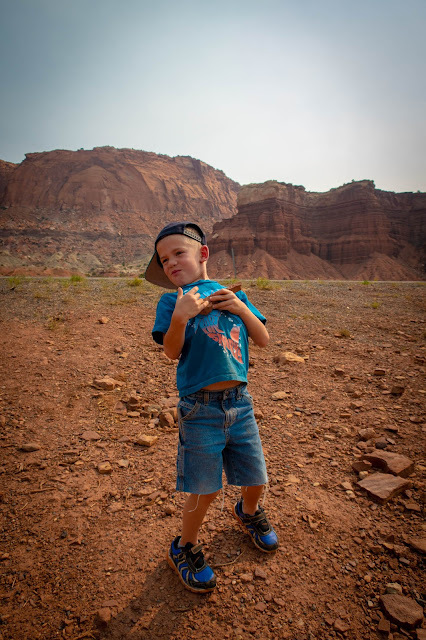 By the time I caught up with them Benjamin had found a rock that reminded him of a guitar and he was rocking out (in every way possible). On Saturday morning after packing up camp we went to gas up before heading to Goblin Valley. We didn't get there though because I took the opportunity of being in civilization to check my phone (there's no service in Grover). That's when I found out that there a huge fire burning at Coal Hallow was threatening our use of Highway 6 (which is the road we'd be taking home from Goblin Valley). To be on the safe side we decided to skip Goblin Valley and just head home (on I-15). We probably would have still made it through the canyon, since they didn't close the highway until Sunday. But it would have been a smoky, smoky drive. We had to drive past an older burn getting home, anyway (which the kids (mostly Benjamin, I guess, since the older girls rode in the RV with Grandma and Grandpa on the way to Grover and Zoë is pretty clueless)) had panicked about on the way out to Grover. Benjamin was worried that the California fires had somehow made their way out here. We assured him that this had been a different fire and that everything was fine. Driving back through that burned out area felt ominous, however, knowing that we were heading home to a raging fire in our canyon. All that remained on the ashen landscape were the blackened skeletons of trees. We passed a highway sign that had been melted and twisted into a misshapen, empty canvas. We could see where the fire had hopped the highway. We could see where it had finally been put out, giving way to mile after mile of bone-dry fields, ready to burst into flames at any moment. We returned home to a hazy valley. Everything smells like smoke. We can hardly see the mountains. I haven't hiked Calf Creek since 2005 (when I went camping in Grover with Andrew's family while he was still on his mission (not at all awkward; it's fine)). Ever since then I've just hung out at the cabin with the babies while Andrew's gone off hiking. This year, however, we decided to lug the baby out there (leaving Zoë behind with Grandma). 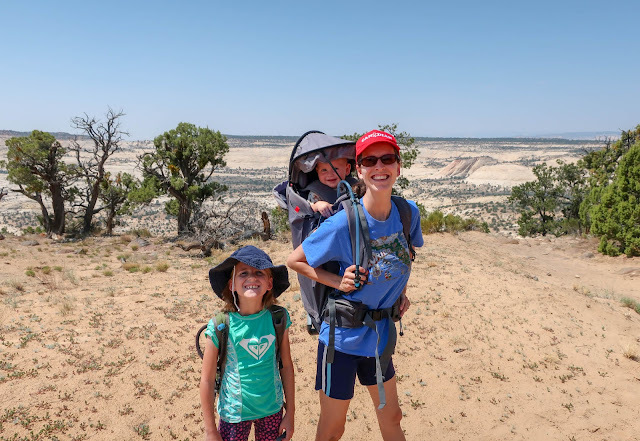 We borrowed a hiking backpack from a friend because we imagined, from the comfort of our air conditioned home, that it would be "fun" to take both Zoë and Alexander on a hike or two with the big kids. But to do that we'd need two hiking backpacks (because Zoë is a bit of a whiner/three-year-old and we wouldn't be able to make her hike more than a mile). Even though we decided to only take Alexander to Calf Creek (because the hike is a little brutal, especially the hike back to the parking lot) we used our friend's backpack because it came with a sunshade and a pocket for a water reservoir/bladder/thing. In fact, I was so impressed with the backpack that the girls suggested we get a new backpack (since ours is rather ancient). I told them that our backpack was a wonderful backpack, that it had served us well for years, and that we weren't really in the market for a new hiking backpack since Alexander is the intended caboose of our little train. Getting a new backpack at this stage in the game would be somewhat pointless. Anyway, we loaded Alexander into the backpack, which I wore for the descent, and we headed off into the rather desolate-looking landscape. We just got back from Grover and, boy, do I have stories to tell! It is rather late, however, so in following Elder Eyring's advice to never miss a day, "no matter how tired I [am] or how early I ... have to start the next day," I'm going to go ahead and post a little bit today (and I know I didn't technically write while we were camping, but I did take notes and that's just about the same thing). Grover is heaven for mess-loving children like mine. There's rocks, there's sticks, there's dirt. There's sticky treats and sweaty feet and sappy trees and a dusty breeze and...all things dirty. While my older girls have somewhat outgrown little kid messes and managed to survive the entire trip looking somewhat glamorous, their younger siblings did not fare so well. In fact, they're well-practiced, rather accomplished mess-makers. We held a family dinner at our house so that everyone could come see Emily—Grandpa Frank and Grandma Pat and Matt and Becky and Nicki all came (and I'm sure I'll write more about it once I go through pictures). 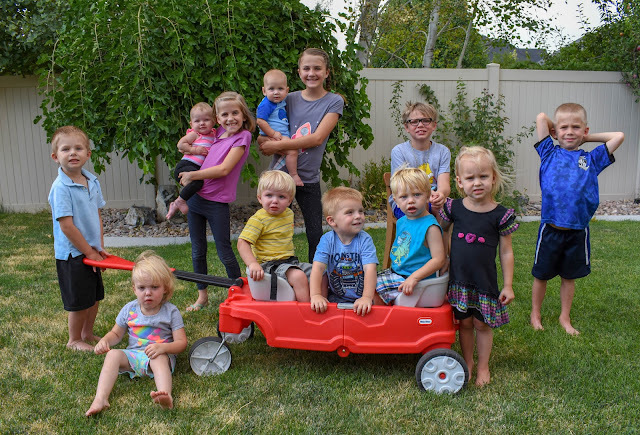 We were lucky enough to have all twelve grandchildren together so we took an updated picture (since Alexander and Arwyn have both changed so much since the last time we had all the grandkids together—at Thanksgiving (now that I've gone back to look at the picture I can see that they've all changed a lot since Thanksgiving)). 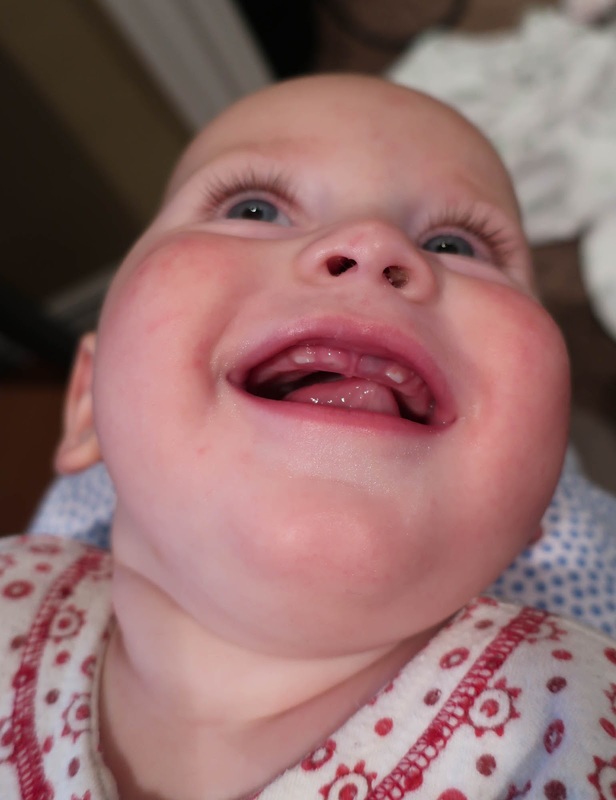 Alexander has been teething nonstop for over a month now, but his sixth tooth is just about here and once it comes through I'm hoping we'll find some respite from his grumpiness. I can't say that I blame him for being a bit ornery because his gums have looked awfully sore, all swollen and bruised. Prior to going on one of our infamous pyjama walks, Zoë and Benjamin were playing in the backyard (due to being too wild to remain cooped up inside). I was clearing the table and loading the dishwasher and they kept bursting into the kitchen to show me the latest rock/stick/bug/plum they'd found. Our plum tree is doing fabulously well this year. Plums aren't exactly my favourite fruit (I've found all store-bought plums that I've had to be both bland and sickly sweet (and mushy)), but having them fresh off the tree has been quite enjoyable. They're a little tangy and full of flavour. And there's a ton of them! Last year we only got, like, three. This year we've had dozens and dozens of them. We've eaten a ton of them, have given some away, and we still can't keep up with them so they're starting to drop to the ground, which wasn't really a problem until I started hearing little thunks and thuds outside. Then those little thunks and thuds got a little braver. And then those thunks and thuds got even braver still! Sometimes when I look into the future and I envision sending my children off to college or on a mission or watching them get married, I tell myself that I will embrace each milestone with grace. There is little reason to be clingy or get teary-eyed, I tell myself. It's not like the child is disappearing. And if I can survive living away from my mother, my children, too, will survive living away from me. But this is all nothing but talk because I've never experienced such a big milestone. I have, however, cried about packing away baby clothes, so if I'm being completely honest I will most likely cry when I'm packing up my baby's bedroom. They won't all necessarily be sad tears, though I'm sure a good portion of them will be. They will also be tears of happiness, I hope, at having raised a good, fledgling adult. They will be tears of worry, knowing that while my child's mind is full of hopes and dreams, their future will also contain a lot of trials and hardship (but definitely also beauty and joy). And, surely, "something more than [tears].... silvery blue, neither gas nor liquid..." there will be a flood of memories as well (Harry Potter and the Deathly Hallows, chapter 32). My niece Rosie got married on Friday and while I was mostly thrilled for her to start her new life, I caught myself thinking, "Darn it all! Now we have to share her!" RoseMarie is a phenomenal person. 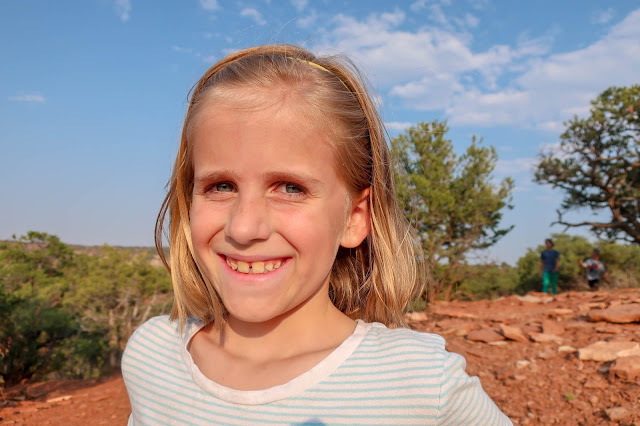 She was born with a cheerful, discerning spirit, and, absolutely overflowing with the spirit of Elijah, she is passionate about her big, messy family. She is fun and helpful and patient and I have always enjoyed being around her. She's found a rather impressive partner for life. I approved of Austin the moment I met him (not that they needed my approval) and was so happy when they got engaged! So I had to remind myself, in that moment of selfishness, that we're not losing Rosie. We're gaining Austin! We're all so glad Austin chose to be a part of this crazy family. At Christmastime, he and I shared a rather awkward moment together when I basically proposed to him for Rosie. I was just asking him a few questions, trying to get to know him a bit better, and I asked, "So, how many siblings do you have?" and he said, "I have three. Two younger brothers and a younger sister." Then I replied, "Oh, how fun! I married an oldest child as well!" And then he stared at me like a deer in the headlights and I was like, "Uhhhh...not that you guys are getting married or anything. Not that it wouldn't be cool if you did decide to get married. That would be fine. But I know you're not engaged. Whatever. It's fine. How about that sky? Talk about blue." Somehow our conversation recovered without Austin running off to hide from me and then a couple of months later he did ask Rosie to marry him so everything worked out just swell. Short story long, Zoë is a habitual beverage scavenger. She doesn't really care whose cup of water is on the counter, she will drink it (and then if she's still thirsty she'll reach for the next cup). On this particular day, I'd told her several times to get out a new cup and I'd get a drink for her since the only cups on the counter were (1) full of vinegar, (2) a sippy cup Riley had used and which had been in the car for several days, (3) Benjamin's cup. She absolutely insisted on drinking from the cups already on the counter, so I pulled out the camera.